So, What Makes Implants So Great? Dental implants are virtually indistinguishable from your natural teeth. Being made from completely natural-looking materials, people will never even know that you replacement teeth! Your complete, beautiful smile will be restored. Beautiful: The implant crown is made of light-reflective material that looks just like tooth enamel. They also repel stains so your dental implants will continue to enhance your smile for years. Highly Successful: According to the American Academy of Oral and Maxillofacial Surgeons, dental implants boast a success rate of over 95 percent, making them the most successful surgical implant. Completely Stable: Due to being fully embedded in the jawbone, dental implants will never move around, unlike partials and dentures. Healthy: Just like natural teeth, dental implants can easily be cleaned by brushing and flossing. Convenient: Unlike partials and dentures, do not need to be taken out. Dental implants can replace one missing tooth, or your entire smile. They can also provide support for a denture, which is snapped on over the implants and is then referred to as an overdenture. Additionally, other tooth replacement methods can actually cause supporting bone to diminish over time. Dental implants work differently: by fusing with the jawbone and locking into place, they actually promote bone growth and can help restore the natural contours of your face and jawline. Thanks to dental implants, you can restore both your oral health and your smile's beauty! To learn more about this fantastic tooth replacement, talk with an expert. Pick up the phone and contact Dr. Brad Beasley of Beasley Family & Implant Dentistry in Athens, Alabama, serving residents of Athens, Huntsville, and Decatur. Call (888) 860-5114 today and discover the benefits of dental implants! Find out how dental implants can give you back the smile you lost. Tooth loss doesn’t have to be forever, especially when you have our Athens, AL, dentist, Dr. R. Brad Beasley, on your side. If you are missing one or more permanent teeth then it’s time you found out what dental implants can do to restore your smile. Most people want a replacement tooth that is as close to a real tooth as possible. While dentures or dental bridges may be less expensive and quicker to get, they don’t offer the same amazing benefits as dental implants. Implants are the only tooth replacements that truly work in much the same way as a natural tooth. What does an implant do? This small metal post or screw is placed into the jawbone to take the place of your missing tooth roots. While you may not realize it, the tooth roots are so very important to the health of your mouth, particularly your jawbone. Your jawbone needs tooth roots in order to remain stable and strong. If you lose a tooth the jawbone will also begin to deteriorate. 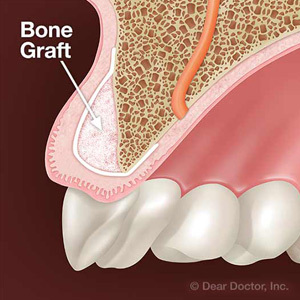 The only way to prevent bone loss is to place an implant where your missing tooth roots used to be. How do you get implants? We need to make sure that your mouth is healthy enough for getting dental implants. This means that we will need to examine your mouth and also run X-rays to check the health of your mouth, particularly the health of your jawbone (since it will need to be strong enough to support the implant). The first step after your consultation is to place the implant into the jawbone. Once the implant is placed there is a waiting period as the implant fuses with the jawbone. Once this is complete we will open the gums up again to place an artificial structure known as an abutment, which will serve to connect the implant with a dental crown. 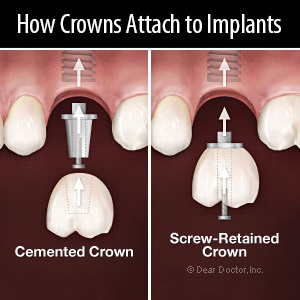 Once the abutment has been placed we will then secure the dental crown over the abutment to complete your restoration. Beasley Family & Implant Dentistry is in Athens, AL and serving Huntsville, AL. If you are interested in getting dental implants in Alabama, then it’s time that you turned to us to get your smile back.